Affinos@ (Kuraray) is a unidirectional porous β-tricarcium phosphate (UDPTCP). 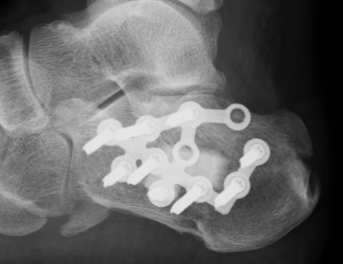 We investigated four patients (four feet) who underwent invasive surgery using UDPTCP to treat calcaneal fractures that were accompanied by a bone defect. The mean age was 63.8±6.4 years old, and the mean observation period was 9.3±3.2 months. We evaluated the changes of UDPTCP over time and correction loss due to its use. In all patients, favorable material absorption and bone substitution were obtained, and their clinical courses were also favorable. Bone grafting is often required to treat bone fractures that are accompanied by a bone defect. 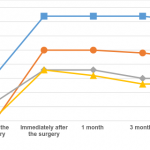 It is apparent that autogenous bone is optimal for bone grafting, but it has disadvantages due to problems with the procedures and quantity of bone graft. Thus, various types of artificial bones have been developed and clinically applied. Affinos@ (Kuraray) is a unidirectional porous β-tricarcium phosphate (UDPTCP) consisting of a novel porous artificial bone with a porosity of 57%, in which communication holes of 25-300 μm are arranged in one direction. 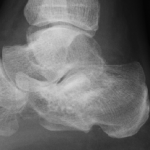 It is characterized by balanced artificial bone resorption and replacement of autologous bone . However, only a few clinical outcomes have been reported using this type of UDPTCP. 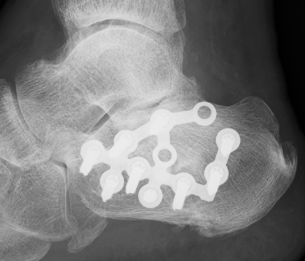 We reported the outcomes of invasive surgeries using UDPTCP in four patients with calcaneus fractures that were accompanied by a bone defect. The subjects were four patients (four feet) who underwent invasive treatments in one of two facilities between February and September 2015. The mean age was 63.8±6.4 years old, and the mean observation period was 9.3±3.2 months. All injuries occurred due to falling accidents, and the radiographic Essex-Lopresti classification was depression type in three patients and tongue type in one patient (Table 1). During the surgery, a small incision was made on the lateral side of the calcaneus to reduce the fracture area, and a UDPTCP block (two patients) or granules (two patients) was used to fill the bone defect area, depending on its size. 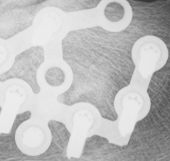 A plate (two patients), Steinmann pin (one patient), or K-wire (one patient) was used for internal fixation. The block was installed so that the communication hole was parallel to the load axis. Partial weight bearing was started after 4-6 weeks of non-weight bearing, and full-body weight bearing was allowed at 9-12 weeks. Plain radiographs were taken before and immediately after the surgery, as well as 1, 3, and 6 months postoperatively to evaluate changes of the UDPTCP and corrective loss over time. The corrective loss was evaluated using the Bohler angle. 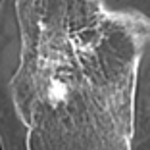 In one patient in whom granules were used, plain computed tomography (CT) was performed at 3, 6, and 12 months postoperatively to observe the material absorption and bone neogenesis over time in detail. Table 1 Radiographic Essex-Lopresti classification of each case. 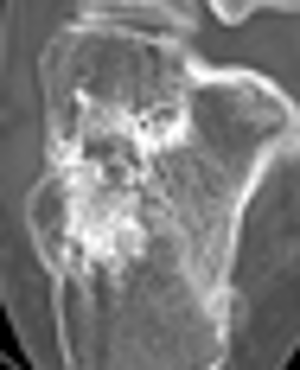 As seen on a plain radiography image, absorption of the UDPTCP progressed within 3 months postoperatively, the majority of the material was absorbed within 6 months postoperatively, and substitution for the bone progressed. On average, the Bohler angle was 5.9° before the operation, 24.5° immediately after, and 21.3° at the final assessment, demonstrating that there was little correction loss after the surgery (Figure 1). 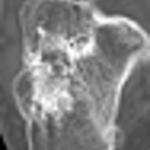 Similar changes over time were observed on plain CT images, and the majority of the material had substituted for bone 1 year postoperatively. Figure 1 Changes of the Bohler angle over time. The patient in Case 1 was a 67-year-old man, and he was injured due to falling from a step ladder during pruning work. He underwent surgery 17 days after the injury. The type of fracture was depression type Ⅱ°. The surgical approach was via a lateral skin incision, and the articular surface was reduced by raising the depressed bone fragment. Part of the UDPTCP block was trimmed to the bone defect part, and three blocks were used to fill the defect. Then, plate fixation was performed. Partial weight bearing was started at 6 weeks postoperatively, and full-body weight bearing was allowed at 10 weeks. During clinical examination, the Bohler angles were as follows: before the surgery: 0°, immediately postoperatively: 25°, and at the final observation (6 months postoperatively): 22°. 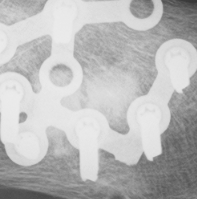 After the surgery, no complications occurred, and, as seen on a plain radiography image, artificial bone was absorbed at 3 months postoperatively. 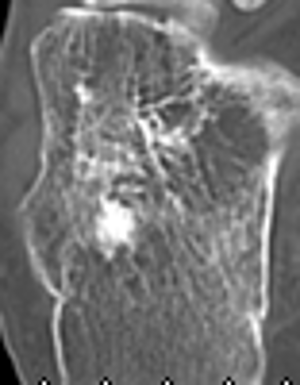 In a plain radiography image that was taken 6 months postoperatively, artificial bone was found to have substituted for the natural bone, and the shadow of the artificial bone almost disappeared (Figure 3). Figure 2 Plain radiography images, from left: at the time of injury, immediately after the surgery, 3 months postoperatively, and 6 months postoperatively. 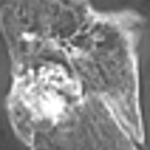 Figure 3 Plain radiography images (zoom). Left: 3 months postoperatively; Right: 6 months postoperatively. The patient in Case 2 was a 60-year-old man who was injured by falling from a truck loading platform. The patient underwent surgery 6 days after the injury. The type of fracture was depression type Ⅲ°. During the surgery, the approach was via a skin incision, and the articular surface was reduced by raising the depressed bone fragment. 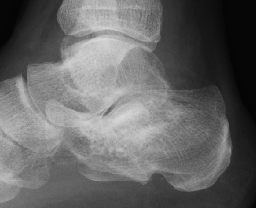 The bone defect area was filled with 2 g of UDPTCP granules. Then, a Steinmann pin was inserted from behind. Partial weight bearing was started at 6 weeks postoperatively, and full-body weight bearing was allowed at 10 weeks. On clinical examination, the Bohler angles were: before the surgery: 1°, immediately after the surgery: 18°, and at final observation (one year postoperatively): 13°. 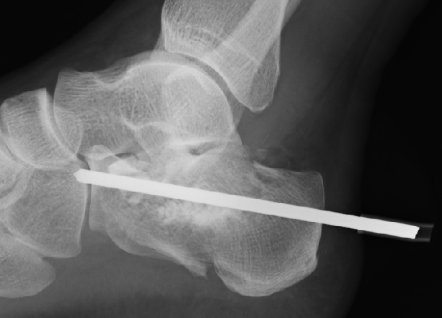 No complications occurred following the surgery, and the Steinmann pin was removed 6 weeks postoperatively. 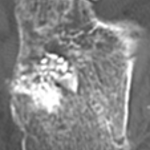 As seen on a plain CT image one year after the surgery, the artificial bone was almost substituted for the natural bone, and the trabecular structure was located inside it (Figure 5). 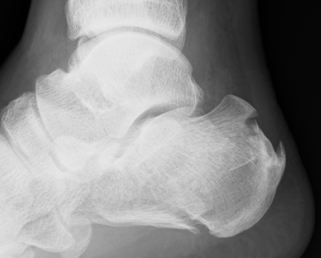 Figure 4 A plain radiography image. Left panel: at the time of injury, middle panel: immediately after the surgery, right panel: 6 months after the surgery. Figure 5 Plain CT images, from left: immediately after the surgery, 3 months after the surgery, 6 months after the surgery, and one year after the surgery. 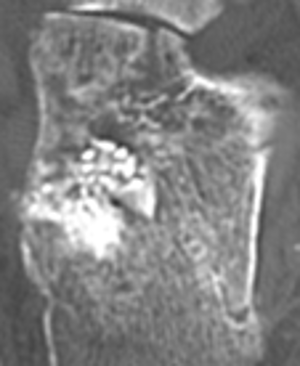 Calcaneal fractures that occur due to falling accidents often result in crushed cancellous bone and bone defects after reduction. 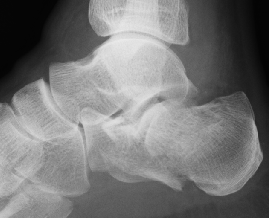 Furthermore, bone atrophy and joint contracture occur following long-term non-weight bearing and fixation, complicating the treatment. 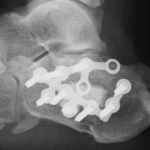 A biomechanical study by Inoue et al reported that performing bone grafting to treat a calcaneal fracture is useful to maintain repaired bone fragments  . 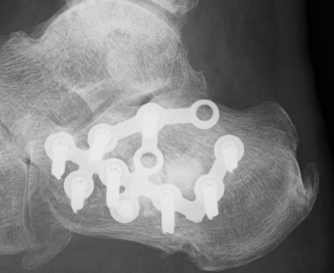 Takai et al.examined the use of β-TCP artificial bone in 5 patients (5 feet) in older patients (aged ≥ 70 years) with calcaneus fractures, and the mean change of the Bohler angle postoperatively was 1°, demonstrating that the procedure has favorable results . Nakagawa et al found that β-TCP has advantages, because it is easy to penetrate β-TCP with a K-wire after grafting . It can also be applied easily in young adults because it can be completely absorbed. However, in some cases, grafted granular β-TCP leaked into the subtalar joint, and was not absorbed even after 1 year or more; therefore, the authors recommended performing grafting with blocked β-TCP instead of granules in patients with comminuted fractures. Regarding UDPTCP, Makihara et al. used rabbit bone defect models and reported that UDPTCP leads to superior absorption and substitution for autologous bone . In the present study, favorable absorption and bone substitution were confirmed for both UDPTCP block and granules, and no patient had an infection or foreign body reaction, indicating that the postoperative outcomes of the procedure are favorable. Furthermore, the correction loss was small, even after weight bearing was started, suggesting that UDPTCP had sufficient strength to withstand early weight bearing. 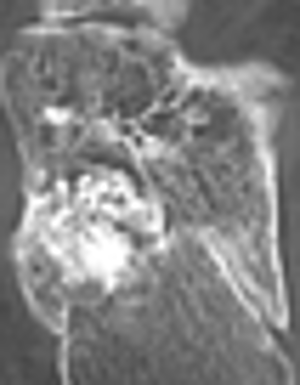 Regarding the speed of replacement for autogenous bone, a report5) using Osferion＠ (porosity 75%; Olympus), which is a common β-TCP that is used in Japan, showed that, on average, assimilated shadows of the surrounding bone and trabecular bone formation appeared at 8 weeks postoperatively, and the shadow of absorbed artificial bone disappeared at 8 months postoperatively. 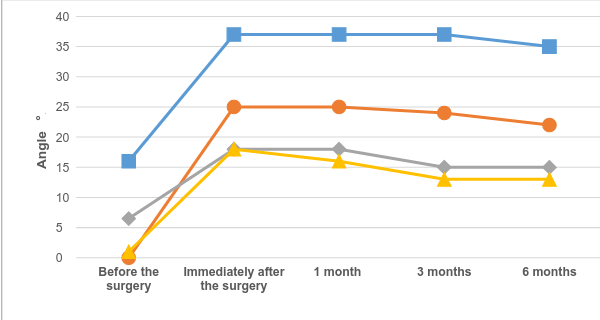 In our study, absorption of artificial bone was observed at 3 months postoperatively in all cases, and the artificial bone was absorbed almost completely and replaced with autogenous bone at 6 months postoperatively in the earliest case. 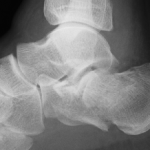 Although the substitution speed varies depending on the amount and site of grafted artificial bone and the patient’s age, the substitution speed of the UDPTCP was comparable with that of conventional β-TCP, suggesting that UDPTCP is a useful bone filling material in the treatment of calcaneal fracture. In conclusion, we performed surgery using UDPTCP in patients with calcaneus fractures. In all cases, favorable material absorption and bone substitution were observed, and the clinical outcomes were favorable. Takeshi M. The balance between bone formation and material resorption in unidirectional porous β-tricalcium phosphate implanted in a rabbit tibia. Key Engineering Materials, 696:177-182, 2016. Nozomu I. 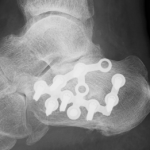 The usefulness of combining bone grafts in open surgery of calcaneus fracture. Fracture, 12:173-177, 1990. 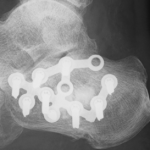 Hirokazu T. Open reduction and internal fixation with artificial bone grafts for calcaneus fractures in elderly people. Journal of Orthopedics & Traumatology, 61:765-768, 2012. 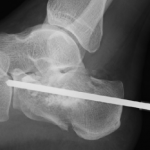 Yusuke N. Treatment outcomes of open reduction and fixation using granularβ-TCP by lateral scalpel for intra articular calcaneus fractures. Fracture, 34:446-450, 2012. Naohiro T. The usefulness of theβ-TCP as bone filling material. 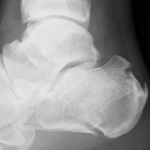 Journal of Orthopedics & Traumatology, 63:875-877, 2014.